California state University, Northridge's annual athletics summer camps give children a fun and exciting summer experience. Photo by David J. Hawkins. Summer is here and so are the California State University, Northridge yearly summer camps. 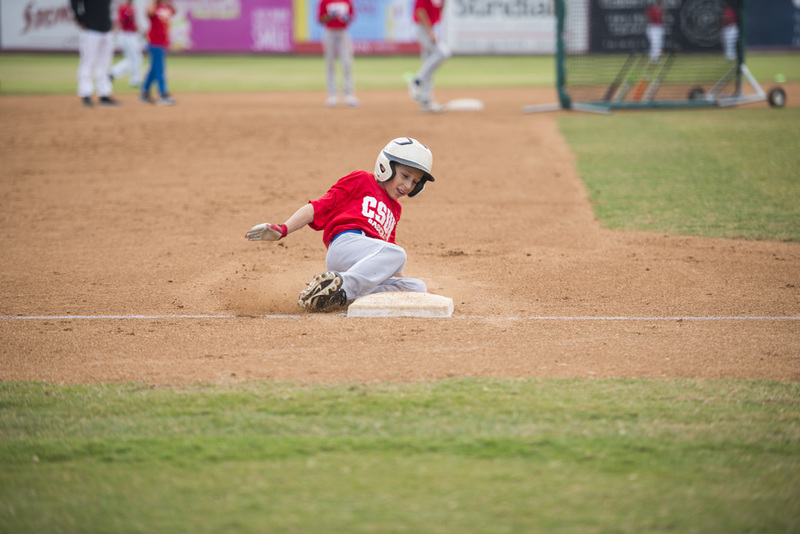 Active children wanting to learn a new sport or improve on their athletics skills this summer can attend CSUN’s summer camps taught by college players and coaches in baseball, basketball, soccer and softball. CSUN’s athletics camps offer children the chance to participate in a fun and exciting summer activity while experiencing their favorite sports and interacting with Matador athletes and coaches. The first round of athletics summer camps begin in June, with new camps starting up throughout the summer. To learn more about this summer’s camps visit the athletics camps website. CSUN’s baseball camp will run six camp sessions at the Matador Field from June through August for children ages 6 to 12. Director of baseball operations Bryan Stauffer emphasizes that the baseball camp aims to help children develop not only their baseball skills but also leadership and life skills consistent with the values of Matador Baseball’s Diamond University. Diamond University is a life skills program that CSUN’s college baseball team uses during the school year to help student athletes to also excel off the field, in the classroom and the community. During the six-hour camp days, children get to learn and practice skills in the morning and then put those skills to the test in the afternoon when campers are divided into teams for contests and games. For campers wanting even more practice, the baseball camps offer additional hitting sessions, at an additional fee, at the end of each camp day. CSUN’s Northridge Soccer Academy is hosting its yearly summer soccer camp for boys and girls ages 5 to 14. The summer camp offers an opportunity for young players to receive valuable instruction on the fundamental skills of soccer and is dedicated to the development and growth of soccer players of all ages and skill levels. No prior soccer experience is necessary. CSUN’s soccer camp lets young players take the Matador Soccer Field for action-filled days taught by Matador coaching staff, players and other local coaches. Campers also receive a one-on-one experience with CSUN student soccer players. After the morning soccer practice, the fun continues as campers attend various activities in the University Student Union and play in the pool. CSUN softball camps offer players of different ages and ability levels to join CSUN softball coaching staff and players on the Matador Diamond to get hands-on softball experience. The instructional camps provide mechanics and drills also taught to CSUN softball players. The CSUN softball camp offers mini sessions throughout June, for children ages 12 to 18, and a Mini Matadors camp at the end of June for children ages 5 to 11. For students in the eighth grade through sophomores in junior college, All Skills camps will be taught in July and August. Jason Flowers’ Back To School Basketball Clinic invites boys and girls in first through eighth grades to a one-day camp at the Matadome on August 18. Coach Flowers and his CSUN women’s basketball coaching staff welcome young players to learn skills that helped lead CSUN women’s basketball team to victory in the 2018 Big West Conference Women’s Basketball Tournament. Children of all skill levels are welcome in attending the one-day camp where they will gain confidence, learn teamwork, and learn and improve fundamental basketball skills through drills and games.